This is what the world has come to. 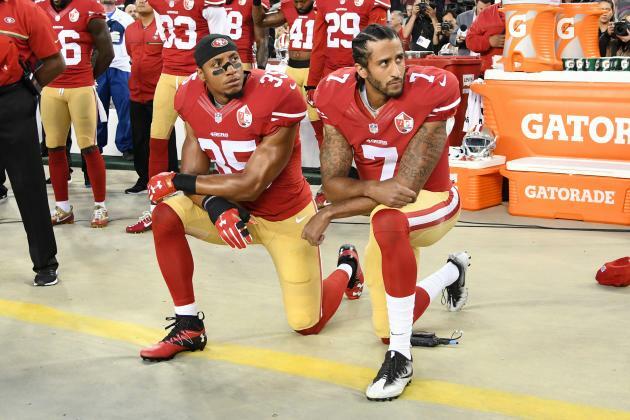 Regardless of whatever Colin Kaepernick’s football legacy turns out to be, there is no doubt about the impact of his extra-curricular activism. Remember when GQ named him citizen of the year? Because there’s nothing that says outstanding citizen more than dividing the country along racial lines. I thought we were past that as a country. A recently proposed law in the state of Indiana is going to give the opportunity for Indianapolis Colts fans to get a refund of their tickets if any of the Colts take a knee for the anthem. I think this is an awful law. If this passes, it will be a tragedy for individual liberty in the country. We don’t need the government stepping in to “solve” this problem. It should be hashed out between consenting parties. The NFL should make it mandatory to stand for the anthem with suspensions or fines for players who don’t comply, or they could just play the anthem before the players come out on the field. Problem solved. The very worst thing that grinds my gears the most is the idea of a “there ought to be a law against that” mentality we have in this country. We already have too many laws, we don’t need any more. In fact, we could do with a harpooning of the bloated whale that is the book of laws in this country. It should be diminished by at least 90%. This is what the founders had in mind when they wrote the 9th and 10th amendments to the Constitution. Sounds like Stalinist Russia to me. You will be respectful… or else. We don’t need this law. Vice President Mike Pence had something to say about the protests at the Colts game as well and tweeted out his displeasure. I get it, I don’t like them disrespecting the country either, especially over bogus claims that somehow the country is racist when it’s the least racist iteration of America ever. But we don’t need a law for this. I consider myself on the right side of the political spectrum, but these hyper-nationalistic Republicans bug me almost as much as the state loving neo-Marxists on the left. Do you agree with my assessment? Is the right side of the political aisle for or against laws like this? Let me know in the comments.